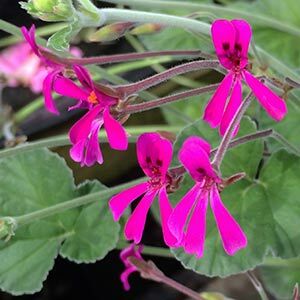 Pelargoniums are varied and one of the best long flowering species is Pelargonium reniforme. Although it is from South Africa it is from the southern areas, evergreen with attractive foliage and small but showy magenta flowers. This is a long flowering species, it starts in spring and flowers right through until early winter. In warmer seasons almost all year. The foliage is rounded with a soft texture, fragrant when crushed. Flowering period will depend on climate, in warmer climates it will flower almost year round. Over time it forms a mounded clump and can easily be pruned back to keep in shape. So for long flowering, easy care, drought tolerant and good foliage give Pelargonium reniforme a try. Drought tolerant, frost tolerant and with great textured foliage, and yes it also flowers with pink flowers rising above the largish kidney shaped foliage. Easy to grow in a sunny position in well drained soil, water when establishing after this it requires little water. Regular pruning will help keep Pelargonium reniforme as a tighter clump. Removal of spent flower beds will increase the second and repeat flushes of flowers through the season. Excellent in the cottage garden, also used for underplanting roses and also useful as a container plant in courtyard gardens and other settings. You could grow Pelargonium reniforme in a hanging basket as it will trail nicely. Propagation is from seed or from cuttings, clumps can also be divided. Height – To 25 cm with flowers held well above. Flowers – Pink to Magenta.